In the 1930s, Mile Cross was famously the first large council estate in England, and it continued to sprawl eastwards until well into the 1960s. 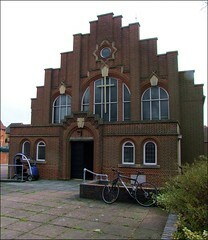 The Aylsham Road is its busiest thoroughfare, and the main landmark building on it is the vast Church of St Catherine. That great Art Deco fortress had been opened in 1935, but a little further out of town is another church which had been opened two years earlier. 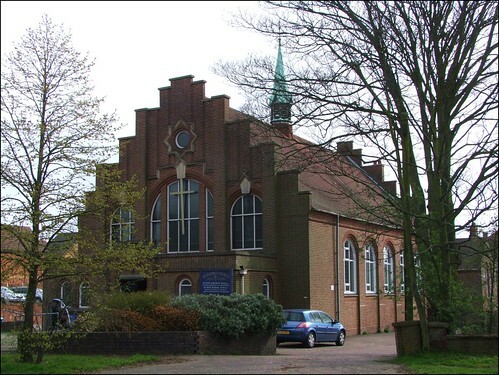 Mile Cross Methodist church wears its Art Deco credentials on a smaller sleeve, with none of the Norman triumphalism of its grander neighbour. 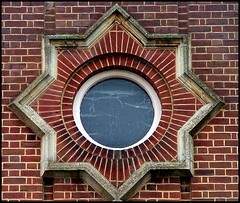 In truth, the architecture is that of the previous decades, but the stepped gable and the eight-pointed star recall the near neo-Byzantine style of some 1930s furnishings. The interior is beautifully well cared for. The ribbed barrel-vaulting of the roof - again, perhaps a motif of an earlier decade - is painted a vivid orange in contrast to the blue of the seating and carpeting below. With the spring sunshine slanting through the windows, it felt a thoroughly cheerful place.